When you’re ready to replace those aging XS650 spoked wheels, Mikes XS has everything you need to do the job right the first time. We offer black or natural XS650 36-spoke wheels and Heritage Special and Special II 48-spoke aluminum or alloy wheels. Or, you can lace up your existing rims with a new XS650 spoke set. Autosol metal polish removes corrosion and protects your XS650 wheel investment, and don’t forget to true your Yamaha XS spoked wheels with a motorcycle spoke wrench set. 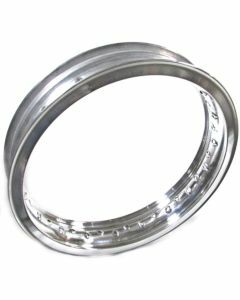 WM 2.50 x 16 x 36 hole rear rim and spoke package.